speed as the race, which averages 22 to 28 miles per hour. be controlling all traffic at certain intersections, treating this as a rolling road closure. •Without alternate routes, please be patient as some delays may occur. Dixie National Forest and Uinta–Wasatch–Cache National Forest. The Larry H. Miller Tour of Utah, the annual six-stage elite cycling race, is coming through Park City this Saturday and Sunday. That means opportunities abound to see world-class cyclists compete, and a labyrinthine sequence of delays in traffic around Summit County. 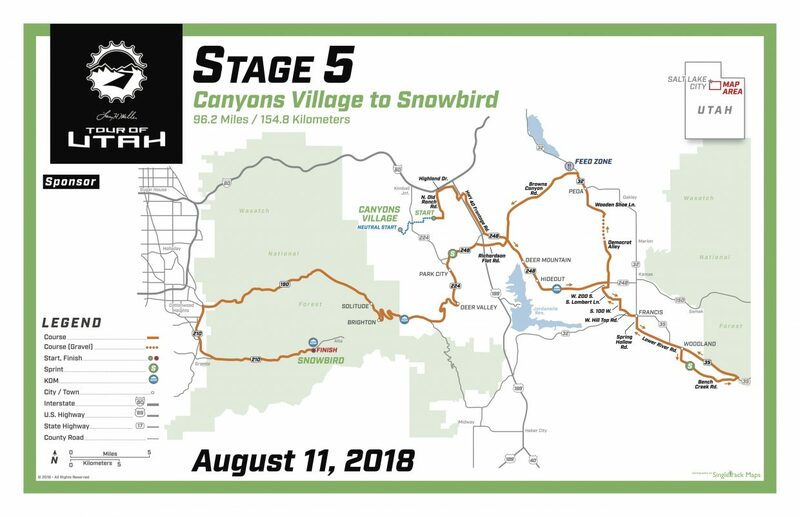 Saturday will be the race’s fifth stage, which will start at Canyons Village and end at Snowbird Resort after shooting out to Woodland, up to Peoa and back through Park City. Stage six, on Sunday, will take racers in a massive loop that starts and finishes in Park City. There will be plenty of viewing opportunities for Summit County residents on both days. Saturday’s race starts at Canyons, with viewing opportunities at Canyons Village, but there are also a handful of good places to watch the race around the county. Tom Noaker, a longtime cyclist and executive director of South Summit Trails Foundation, said the top of Empire Pass during Saturday’s Canyon’s stage will be a decisive moment and a good vantage point, though parking there will likely be limited. The top of Empire Pass is only the beginning of the second King of the Mountain leg in Saturday’s race, but Noaker said it will likely separate the racers. No race is over until it’s over, but those who want to see the end of Saturday’s race are advised to make their moves early, as access to Little Cottonwood Canyon will be closed between noon and 5 p.m.
On either day, the top of Brown’s Canyon will also give a good view of the race. Bob Kollar, vice president of special events for Park City Chamber of Commerce and Visitors’ Bureau and chair of the Tour of Utah’s local organizing committee, recommends getting to Main Street early for the sixth stage on Sunday. He expects between 10,000 and 15,000 spectators to turn out for the event. Riders will race around the city from the top of Main near Swede Alley down to Heber Avenue, then back up Deer Valley Drive for another pass down Main before the racers exit onto Bonanza Drive. There will be a free bike valet at the parking lot off Swede Alley across from the transit center for spectators who arrived on their own bikes. There will also be a beer garden with a big-screen viewing station on upper Main Street and another viewing station at Miners Park. After the start of the race, people are invited to decorate the final stretch of Main Street with chalk from 1:30 p.m. until 3 p.m., in anticipation of the racers’ return. There will also be a kids’ bicycle sprint up Main Street for kids ages 5 to 12 during that same time period. Closed toe shoes and a helmet are required to participate. For those looking to see more technical climbing, sections of North Trappers Loop Road could show racers competing in a tightly packed field as they race down the winding road on Sunday. Those in downtown Heber and Midway will see the race up close as it passes down Center Street and S.R. 113. Noaker said watching from home isn’t a bad option either, since broadcast race coverage gives a good view of the competition. Roads between Canyons Village and Old Ranch Road will likely be affected by traffic between 7:30 a.m. and 8:15 a.m. for the Ultimate Challenge, a paid-participation recreational ride shadowing the Tour of Utah’s route. The Tour itself will begin at 11:30 a.m. at Canyons Village and will go down Canyons Resort Road, Frostwood Drive, Cooper Lane, Sun Peak Drive and Old Ranch Road, with traffic delays from 11:30 to 11:55 a.m. It will then travel over Old Ranch Road, go east on Highland Drive, then use Silver Summit Parkway and Old Highway 40 to access S.R. 248, reaching the Summit-Salt Lake county line between 12:09 and 12:20 p.m. Competitors will return through Park City via Browns Canyon Road, S.R. 248 past Park City High School, and up S.R. 224 past Deer Valley to Guardsman Pass between 1:45 and 3:05 p.m.
Big Cottonwood Canyon will be closed to all vehicle and bike traffic between noon and 2 p.m., and Little Cottonwood Canyon will be closed to the same between 1 p.m. and 5 p.m.
Main Street will be closed to automobile traffic and parking beginning at 4 a.m., from Heber Avenue to Swede Alley, on Sunday. The race begins at 12:15 p.m., starting with two ceremonial laps of 5-10 minutes each around Old Town, with Deer Valley Drive, Swede Alley and Main Street closed to traffic. The racers will exit onto Bonanza Drive and turn right onto Kearns Boulevard (S.R. 248). The race begins in earnest at the intersection with Sidewinder Drive between 12:25 and 12:35 p.m. Cyclists will not be allowed to try pushing the race’s pace or make significant passes until then. The race will leave the Park City area via S.R. 248 and Richardson Flat Road. It’s expected to reach Center Street in Heber between 2:25-3:15 p.m. It will travel through downtown Midway on S.R. 113 onto North 200 West between 2:35 and 3:20 p.m. The race will return to Park City via Pine Canyon Drive and will finish by going down Marsac Avenue to Main Street, finishing between 3:15 to 4 p.m.
Spectators encouraged to arrive early wherever they plan to view the race from. Parking is free at Park City High School, Treasure Mountain Junior High, Park City Mountain base area and the Cabriolet parking lot at Canyons. Those who want to park downtown can pay $20 per vehicle for a space in the China Bridge parking garage, which will be accessible only from Marsac Avenue. Because the parking structure exits onto the race course, no vehicles will be able to exit between 3 and 5 p.m.